NEW YORK Falling temperatures on Sunday put more people at risk in a region already battling gasoline shortages, stubborn power outages and spasms of lawlessness in the wake of Superstorm Sandy. With overnight temperatures in the 30s and nearly a million people still without power in the area, New York City opened warming shelters in areas without power and Mayor Michael Bloomberg urged older residents without heat to move to them. The city also was handing out 25,000 blankets to residents who insist on staying in powerless homes. "So please," Bloomberg said, "I know sometimes people are reticent to take advantage of services. The cold really is something that is dangerous." On Sunday morning New York Gov. Andrew Cuomo said cold temperatures will leave "tens of thousands" of people whose homes have been damaged by Sandy needing other places to live. He said "it's going to become increasingly clear" that homes without heat are uninhabitable as temperatures drop. He said that means that residents who have been reluctant to leave their homes will have to, and that they'll need housing. Bloomberg said the city expects that it will have to find housing for 30,000 to 40,000 people. He also said that resolving gas shortages could take days. The storm killed more than 100 people in 10 states, including 41 in New York City. More than 2.2 million customers in several states remain without power days after Sandy came ashore. About 875,000 still don't have electricity in the New York metropolitan area, including about 460,000 on Long Island. Lines curled around gas stations for many blocks all over the stricken region, including northern New Jersey, where Gov. Chris Christie imposed rationing that recalled the worst days of fuel shortages of the 1970s. 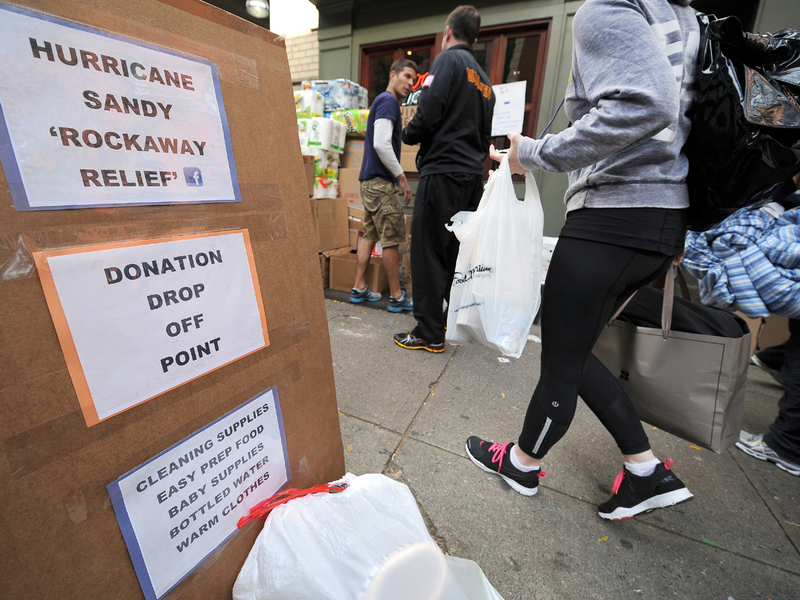 Queues of honking cars, frustrated drivers and people on foot carrying containers were just the latest testament to the misery unleashed by Sandy. "I spoke with many people who were worried and frustrated and cold," Bloomberg said after a visit to the Rockaways in Queens. "There is no power there and temperatures are dropping. Even those who have generators are having a hard time getting fuel." "It's chaos; it's pandemonium out here," said Chris Damon, who had been waiting for 3 ½ hours at a site where the National Guard was giving out free gas in an effort to alleviate the situation. "It seems like nobody has any answers." After at least 10 arrests for line jumping on Friday, the police presence at stations with gas lines was increased Saturday. Still, there was one arrest for disorderly conduct at the armory in Brooklyn, where free gasoline was being distributed. With fuel deliveries cut off by storm damage and many metropolitan-area gas stations lacking the electricity needed to operate their pumps, drivers waited in line for hours for a chance at a fill-up, snapping at each other and honking their horns in frustration. At a gas station in Mount Vernon, N.Y., north of New York City, 62 cars were lined up around the block Sunday morning even though it was closed and had no fuel. "I heard they might be getting a delivery. So I came here and I'm waiting," said the first driver in line, Earl Tuck. He had been there at least two hours by 9 a.m., and there was no delivery truck in sight. But he said he would stick it out. The cashier at the station, Ahmed Nawaz, said he wasn't sure when the pumps might be running again. "We are expecting a delivery. But yesterday we weren't expecting one, and we got one. So I don't know," he said. Bloomberg said that resolving the gas shortages could take days. Across northern New Jersey, Gov. Chris Christie imposed odd-even gas rationing that recalled the gasoline crisis of the 1970s. About 80 percent of New York City's subway service has been restored. The Long Island Rail Road - which yesterday said it is only able to use two of the four East River tunnels due to flooding - will operate a modified schedule on all branches except the Long Beach branch on Monday. Trains on the Ronkonkoma Branch will not operate east of Ronkonkoma, and trains on the Montauk Branch will not operate east of Speonk. NY Waterway plans to operate normal ferry/bus service, including service from the Hoboken Rail/Ferry Terminal, starting at 6 a.m. Monday. There will be no service from Jersey City's Port Liberte terminal, which was damaged severely by Sandy. Regular weekend service continues Sunday from 8 a.m. until 1:10 a.m. between Port Imperial in Weehawken, N.J., and West 39th Street in Manhattan. It includes free connecting bus service. Ferries also will operate on a normal weekend schedule between Lincoln Harbor in Weehawken, 14th Street in Hoboken and West 39th Street. New York City's parks also reopened Saturday, and with Sunday's marathon canceled, many of the runners who had come to town for the race worked out their frustrations with a jog through Central Park. "A lot of people just want to finish what they've started," said Lance Svendsen, organizer of a group called Run Anyway. Some of those who were planning to run the 26.2-mile race through the city streets instead headed to hard-hit Staten Island to help storm victims. A Facebook page invited runners to meet Sunday in the park and encouraged marathoners to bring food, clothes or money to donate to storm victims.